VANCOUVER, British Columbia, Nov. 26, 2018 (GLOBE NEWSWIRE) -- Chakana Copper Corp. (TSX-V: PERU; OTCQB: CHKKF; FWB: 1ZX) (the “Company” or “Chakana) is pleased to report that it has received final government approval of the Semi-detailed Environmental Impact Assessment (EIAsd) covering a portion of the Soledad copper-gold-silver project in Peru. The approval applies to the original area of the Declaration of Environmental Impact (DIA) on the Soledad exploration permit and includes 120 additional drilling platforms. Map showing Chakana’s 3,085-hectare land position with known breccia pipes and occurrences. 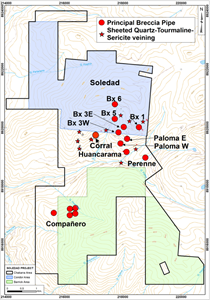 Area of original Condor land position shown in blue, Rosales land position in white, and Barrick concessions in green. The original Declaration of Environmental Impact (DIA) was limited to the Condor concessions.